A solid Annan kata with sharp movement performed by V. Dack from France. 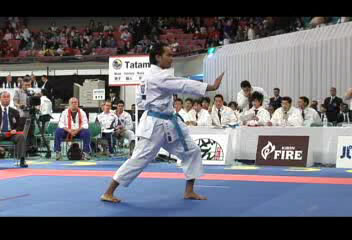 This video was taken from 19th WKF Tournament 2008 in Tokyo Japan for 3rd place match. Annan| Performer: V.Dack | Duration: 00:02:35 | Format: mpg | Video Size: 24,8 MB | Source : karate-do.co.jp | Player: Windows Media Player or Media Player Classic.